I LOVE WINTER! Cozy sweaters, roaring fireplaces, snuggling up with a warm-blooded friend: furry pooch, cuddly guy, and affectionate horse, all equal and welcome in my house and my arms! Roasting marshmallows over my outdoor fire pit, inviting friends, family and neighbors over to burrow beneath blankets under the stars and full moon are also two of my favorite winter pass times. 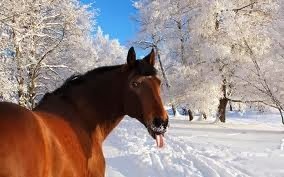 Thankfully, identifying your horses’ needs in the cold winter weather is much easier. Paying attention to your equine friend’s signals and instincts will help you figure out how to gauge who likes to play in the snow, who prefers a blanket to cozying up under his own natural, long winter coat and who prefers to be inside his stall altogether, taking in all the action from the safety of his own warm barn. In the cold days ahead until that first flowering bud sprouts this upcoming spring, just keep in mind, that your horse is as individual and unique as any human friend who’s company you may enjoy. He has particular tastes, wants and dislikes that all inform his preferences. Keep vigilant watch and he’ll tell you what he needs and when he needs it. North American Racing Academy's Got It Going On! Mucho Macho Man MANIA, Deservedly So!! !